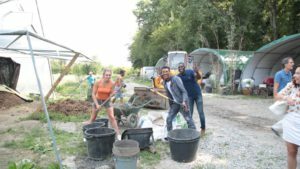 As part of our CSR programme, the Swiss division of BNPP held a solidarity event during the afternoon of 25th August, giving employees the opportunity to meet and talk with migrants, while making a contribution to the development of organic agriculture locally. The initiative is a great example of our CSR strategy in action, illustrating our commitment to issues of citizenship and society. It was an ideal opportunity for BNPP Switzerland to align itself with the Group as a whole on the subject of supporting refugees. The aim of the afternoon session was to rally our employees around the bank’s core values, while doing our bit to promote the integration of migrants. This experience gave participants an opportunity to meet and exchange ideas, getting to know and understand each other better. 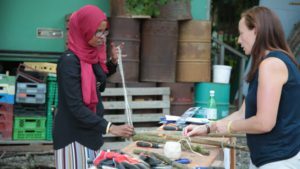 With a variety of workshops, participants were invited to explore the challenges and opportunities of sustainable development and agro-ecology. Our hosts for the afternoon were Mamajah, a local association dedicated to solidarity and eco-design, with a large plot of farmland just outside Geneva. The participants had lunch together, then set about harvesting vegetables, sculpting wood, weeding the land and taking part in a quiz on sustainable development. A total of 35 employees took part in this afternoon event embracing solidarity. Once the ice was broken, the atmosphere was warm and friendly. At the end of the day, many participants exchanged phone numbers and promised to get together soon.